Do you love Greek cuisine? 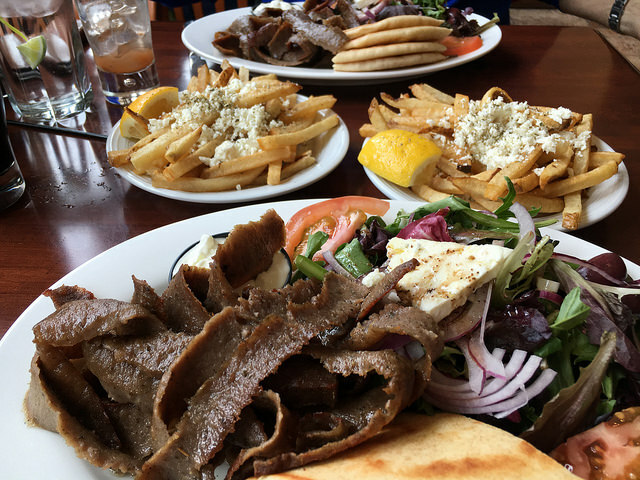 If you're in the mood for a fresh made gyro or a souvlaki platter, you'll find both at Plaka Grill. This popular, affordable eatery in Falls Church is one of the best spots in town for all of your favorite Greek dishes. Inside, Plaka Grill is stylish and modern, with wall-to-wall windows, industrial light fixtures and ample seating for any size party. If you prefer to dine al fresco, Plaka Grill also has a spacious outdoor patio with umbrella-covered tables. Pick up a chicken souvlaki platter with a fresh Greek salad or marinated vegetables, or if you're in the mood for something a bit heartier, try a Chicago-style gyro with crispy fries on the side. For of-age guests, Plaka Grill also features a nifty wine dispensing machine with a wide variety of wines.